A lovely array of sensors there, Mlle. Chef. I usually take the temperature by hand (modesty forbids me to describe the various carcass options open) and sing “Fever” while the incineration is taking place. Yes, for meats that go “moo” I like ‘em rare. Have been known to cook with a 60 W lightbulb. Happy Thanksgiving to you and all who frequent this site! Thanks, Sully! Hope you and yours will have a grand day. Anyone cooking a turkey could sure use one of these thermometers -- rare turkey is not a good thing! Cheryl, I don't know about pressure cookers -- they've always scared me -- but I know you will love a thermometer! Hi! I am not sure how you found me, but am glad you love cats! Welcome, and hope you will follow me! Hug. Ann, I think it was through your comment on Cranberry Morning, if I recall correctly. I need all the help I can in the kitchen. Our turkey was probably done HOURS before I took it out... I couldn't find our thermometer and didn't want to takers chance with underside meat. Well, I had no problem there! Gravy to the rescue! Anita, I knooooow! :D I was just thinking that millions of people probably ate overcooked turkey today because they didn't have a good thermometer. *Every*one does that because of the dangers of undercooked poultry. Thank goodness for gravy! Thank you for doing this giveaway. I would be very grateful to win this equipment. A very practical kitchen gadget that everyone should have! I always use a thermometer for my turkey and making candy. I could certainly use an updated one but I am Canadian so I'm out of the running. But I'm sure someone will be very happy to win. Great giveaway! Thanks for sharing and I hope you have a fabulous Thanksgiving weekend! Sorry, Sandi! Some brands specify US only or a few countries. Once in a while they are open to the entire world. I hope one of your readers will win one of the four prizes! Wow, perfect timing! I broke my candy thermometer while making walnut fudge pie for Thanksgiving and am feeling a bit lost without a way to gauge the perfect hard-ball stage for my upcoming holiday candy recipe. I would love to have the high-quality thermometers you're offering! Betsy, it IS hard to gauge the candy stages without a good thermometer. Hope you win one of these! Thanks for the opportunity. Any one of these would make a great stocking stuffer. Sarah, good idea! Hmmm ... Maybe if I give such things to my husband, he'll take over some of the cooking! Oh, Michelle! It's a good thing I don't move often, I'd be hopeless! I love using a thermometer in the kitchen - it means I can be absolutely sure everything is just right! Thank you for sharing this great giveaway with us at Hearth and Soul, Jean! Thank *you*, April. Love Hearth and Soul! Hello, after this past Thanksgiving I found out I could use a new thermometer. I am not sure if mine was working correctly. These all look great, thanks for sharing. Have a happy weekend! Eileen, I bet a lot of people wish they'd had a nice new thermometer on Thanksgiving! :-) A lot of people overcook their turkeys "just to be on the safe side." I'm a kitchen thermometer fanatic, it makes all the difference in the world! Thanks so much for stopping by and what a lovely blog you have. I never use a thermometer but probably should. I'll look forward to stopping by again! Yes, Sue, I think so, too! Thanks, Lea! Hope to see you back here soon. Thank you for the opportunity to win such a useful item. Love kitchen tools and am in neeed of a new thermometer. Lots of candy to make for gift giving. Thank you for your visit to my dormant blog! I have just read through some of your recipes and hope to try the fried chicken, it's something I've never got right. But then I didn't have an american grandma! good to meet you. I'll be popping back when I can. Thanks, Mary Jane! You'll love the speed and accuracy of these thermometers. Elizabeth, thank you. I learned a lot of different things, having an English grandmother and a Southern grandmother! By the way, I made your pot roast recipe last weekend and it was out of this world delicious! I'll have to add it to my standard rotation of tasty dinners. I've been craving more of those golumpkis too! Aaw! Thank you so much, Richard! My friend and I will be making more cabbage rolls on the 10th (we call it G-day!). I am thinking about making some Christmas candy. 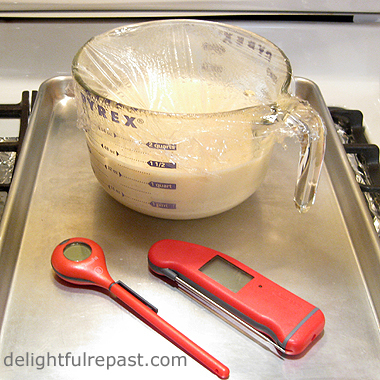 The recipe calls for you to check the mixture with a thermometer. Laura, yes, it really does simplify candy making! So many times I wish I'd had one of these. I'd love to win one! Thanks, and Happy Holidays! Rusthawk, you'll wonder how you ever got along without it! Love to win... I have been wanting one! Maybe you will, Manda -- good odds! Is it wrong that I want to win this and give it to my sister-in-law so I don't have to suffer through another prime-rib-turned-into-beef-jerky dinners? :D No, Tina, it isn't wrong! And you can tell her that with a thermometer you can achieve well (properly) done "well done" (if that is her aim) that is actually not *over*done (AKA ruined!). What a great giveaway, Jean!! Thank you for the opportunity to be put in the drawing. I also looked at your southern boneless fried chicken...a must try!! Thank you for your kind visit to my blog. It is greatly appreciated. Thanks, Kitty! And be sure to come back next week -- another giveaway, and one *you* will love! Brandie, thank you! Good that your husband has his own -- two thermometers, no waiting! Appreciate the info and giveaway! There are certain kitchen gadgets that are my favorites, like the metal spatula I received at my wedding shower (35 years ago!). Thanks so much! Karen, thank you. I have a metal spatula, too, was given to me by my sister many years ago, nothing fancy, but it's my favorite! Wonderful and practical giveaway! Love the precision of thermometers. That is tempting giveaway Jean. I love the all these goodies, excellent for my bread baking ventures. I do, too, Mary. Otherwise, I tend to overcook something rather than take a chance on it being underdone. Yes, Swathi, I love being able to take the temperature of a loaf of bread rather than tapping it to "hear" if it's done! I would love to win a thermometer! What a nice piece of equipment to giveaway for the holiday season! Thanks for the chance. Thanks for joining Home Sweet Home! Would love to get a chance to use these! They look like they would really help in candy making. Thanks, TCOH. These items do make wonderful gifts! Jenne, yes, they are wonderful for candy and so many other things. I aready live Thermapen and would love to win this set! chefnaomigallego@gmail.com! Steve, Chris and Naomi, thanks for entering. Just to clarify, the prize is not the set of four (for one winner), it's one of the four items (for four winners). But even if you win one you already have, it will make a great gift for someone you know! Great product! Good luck everyone! I hope to win one for my mom. We always rely on the pop-up thingy on the turkey to "pop-up" to alert us when the turkey is done. 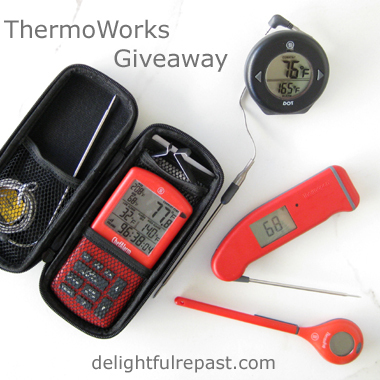 *Giveaway Winners Announced* - The winners of the ThermoWorks thermometers, by random drawing, are Kitty (ChefAlarm), Mary Jane (DOT), Swathi (Thermapen) and Anita (ThermoPop). Winners, as soon as you send me, delightfulrepast at aol dot com, your name, address, phone number (required by shipper) and color choice, ThermoWorks will ship the thermometer to you. Congratulations! If I don't hear from the winner(s) of the random drawing by 11:59 am Eastern time Sunday, December 6, another drawing will be held and new winner(s) selected from among the original entrants (those who commented before the giveaway deadline). This was fun! 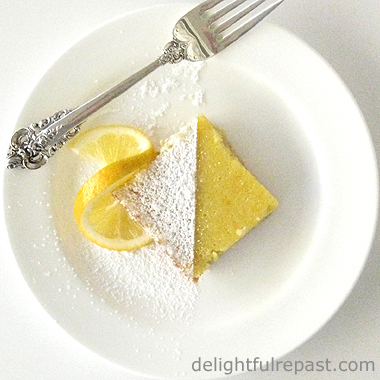 Watch for more giveaways here at Delightful Repast! There's one next week, in fact! In the meantime, follow me on Google and Twitter. You can even use the Follow Me By Email button in the right column. I am so excited, Jean, and so thrilled to be the winner of the ChefAlarm!!! Oh, how I will put it to use in my kitchen for meat, bread, candy, etc. This is such a generous giveaway and so much appreciated. I just emailed you my address. Kitty, I hope you will enjoy it! ThermoWorks products are so well made, you'll have it for a very long time. Well, Pooh! I didn't see this in time! I know everyone loved the opportunity to join the giveaway! Thanks for linking it up with us at Country Fair Blog Party, we love having you join us! Jan, that's pretty strong language! LOL Sorry you missed it! I love doing giveaways, so there will be more in 2016.